The mission of Keep Guntersville Beautiful is to foster engagement in behaviors and service projects that that sustain and enhance the beautiful, healthy, and clean atmosphere of our lakeside community. We develop partnerships and innovative programs that inspire dynamic acts of recycling, beautification, litter prevention and community greening. 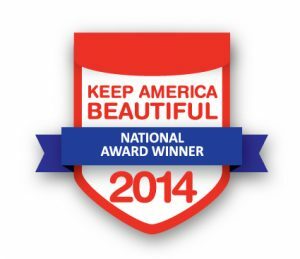 For more than 20 years, our program has been consistently recognized for excellence as a leading affiliate of Keep America Beautiful, Inc or KAB. We work closely with the Recycling, Public Works Ordinance Enforcement and the Horticulture Department to provide services that keep Guntersville a beautiful place to call home and a breathtaking place to visit. Annual events include the springtime Great American Cleanup, National Planting Day and America Recycles Day activities in the fall. Join our team of inspired volunteers for our organized community events or let us plan a service project for your group. Contributions of as little as 30 minutes of your time picking up litter or planting can make a big impact when we all work together. Recent community KAB projects have included projects to restore areas of Civitan Park destroyed during the April 2011 tornadoes such as the Azalea Walking Trail and the Hope in Bloom Garden honoring community cancer patients and their families. The Azalea Trail is sustained through memorial or honorarium azaleas purchased through this office. Purchase of azaleas is usually $25 per plant (special offer discounts are typically offered for Mother’s Day, Grandparents’ Day and Christmas) and includes name inscription on the Azalea Trail Plaque located in the Guntersville Recreation Center. Keep Guntersville Beautiful actively seeks grants and in-kind assistance and sponsorships to promote our projects. Keep Guntersville Beautiful shared a post. "Even potentially recyclable materials can become contaminates if those items are NOT collected by your local recycling program."